Electronic distribution of intellectual property (IP) poses numerous risks for the creators of the content, since it becomes difficult to maintain control of such property or monitor who is using it and for what purpose. Ownership can be hard to prove, and authors may be unable to stop infringements or monetise their works effectively. Traditionally, IP rights are managed by the notaries via cumbersome and expensive procedures. And the time between the creation of an original idea to the time a patent gets filed can be quite long, resulting in lack of IP protection. For companies that produce inventions or other content worth protecting, it bears high risks and high operational cost. Using blockchain as an IP registry, authors can store IP as an encrypted document, representing a digital certificate of authenticity. It ensures a tamper-proof evidence of ownership and a chronological recording of transactions, and promotes transparency and decentralisation. Since blockchain transactions are immutable due to the proof-of-work algorithm, once the information has been registered on the blockchain, it can never be lost or changed, retaining the moral right with the author. The IP stored on the blockchain can be saved in an encrypted format, allowing only authorised parties, such as the author, collecting societies, or customers who have paid for access, to decrypt the information. Blockchain also offers possibilities for licensing works by reducing the cost of transactions and creating a direct link between authors and users. Smart contracts, atomic swaps, and other techniques can assist in the sale and licensing of intellectual property and automate the workload of the collecting societies. A smart contract is a computer program which can facilitate, execute, and enforce a contract by itself. The terms of the contract are pre-programmed, so that the parties can do business without the administrative burden and cost. For example, in IP, such methods could mean that licences are self-executing upon use of a work. Smart contracts can also be tied into micropayments for use of content. Doing so would work by the author assigning a Bitcoin address to the content, which then allows a potential user to make a small payment to the author in return for use. As a result, the author can be remunerated without having to pay the high transactions costs of existing financial networks. Such a method is simpler and more transparent than many other existing means of payment for authors. An author produces some content. The author encrypts the content using their public key. The encrypted content is then inserted into a transaction T1 (for example, within OP_PUSH … OP_DROP in the locking script). The transaction is submitted, and stored on the blockchain. At any time, the author can prove ownership of the content by decrypting it and signing a message using the Bitcoin root hierarchical key. Such a step ensures a provable, timestamped, and immutable proof of ownership for the IP registration. A reader requests access to the IP. Doing so involves the exchange of public keys of the reader and the author, which occurs off-block or through a P2P swap of a symmetric access key. The author encrypts the content with the public key of the reader and a new public key for which the private key is kept secret. The author then creates a transaction T2 that stores the new encryption on the blockchain. The reader makes a payment transaction T3 to the author’s address. The payment can only be spent if the secret key is revealed. The author spends the funds of T3, and thus releases the secret private key to the reader. Doing so equips the reader with all information required to decrypt the IP stored in transaction T2. The blockchain contains an immutable record of the access transaction, proving that the reader has paid the fee to access the IP stored on the blockchain. As blockchain technology goes mainstream in various industries such as finance, supply chain management, and manufacturing, acceptance of blockchain by governments is a mere question of time; several notarisation firms, such as P&TS (Switzerland), already offer notarisation services for invention announcements based on blockchain technology, in order to establish irrefutably the possession of an invention or a work . Proof of existence  is an online-notary public service that allows its users to upload digital documents and get them verified by the blockchain without exposing the content. With many outdated and inefficient systems (or none at all) in place, we may see blockchain solutions being introduced to streamline and simplify the management of intellectual property. 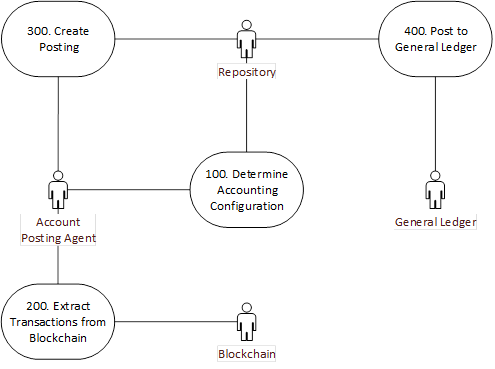 The following use-case model demonstrates the steps involved in a generic blockchain-posting approach. We can map and save data, secured using a shared secret and saved on the public blockchain in a manner that allows it to be unalterable, too. A part of the idea is to have a system that allows the IP to be mapped. Not merely loaded, but to be recoverable and able to be found when needed . In this section we abstract the atomic-swap procedure one level further to the atomic exchange of access to a controlled resource. 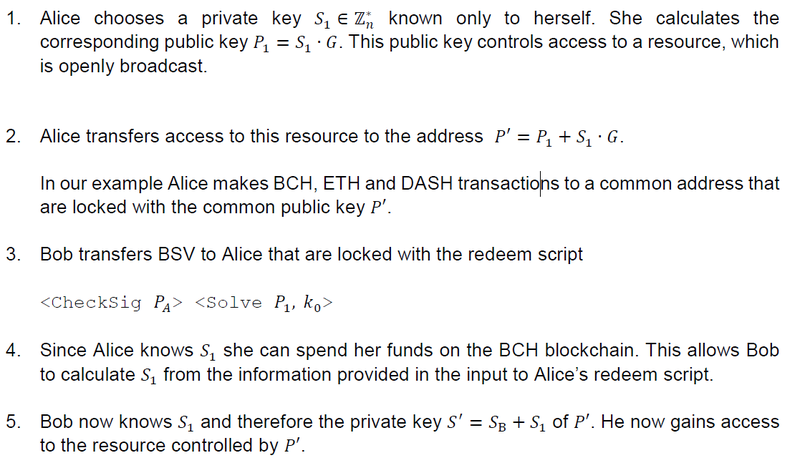 Suppose Alice controls access to some resource by an ECC public/private key pair. Such a resource could be funds of one type of cryptocurrency, it could be funds in multiple types of cryptocurrency, or it could be access to a webapp, a rental car, or an encrypted document. We will present a method for Bob to buy access to such a resource from Alice in BSV. The exchange is atomic: either Alice spends the BSV she has received from Bob and Bob gets access to the resource, or neither happen. The method is derived from section 2 of [nChain, 2018] on pseudonymous key transfers. 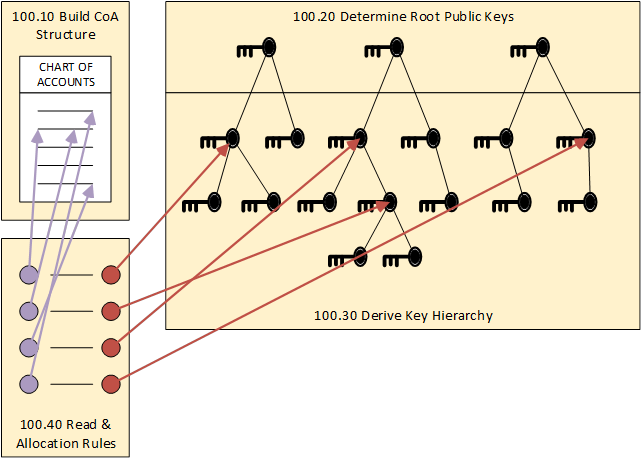 The key difference here is that we do not need an additional step of performing a traditional atomic swap involving hash puzzles to construct a derived private key. Instead, we use the generalised atomic-swap method to allow the private key to be exposed in the same step as the transfer of value. Note that although the private key 𝑆1 is exposed to the public on the blockchain, it is only Bob who can spend the funds locked at 𝑃′. This is because the funds are locked with the combination of 𝑆1 and Bob’s private key. In a sense, 𝑆1 acts as a deterministic key. In our example, we see that we no longer require that the crypto assets that Bob is buying contain certain operations in their scripting language. We merely require that Bob pays for the collection of crypto assets in BSV and that the transactions are controlled using ECDSA signatures, which is a very light requirement. Blockchain creates real efficacy and is a wonder of modern technology relieving and disrupting much more than we can currently imagine. Great stuff!